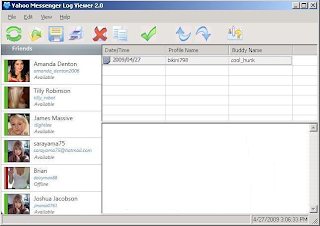 Yahoo Messenger Log Viewer allows you to view chat logs of IM buddies, without needing to log in to MSN or Yahoo. Either you want to read your own chat logs or you want to spy on your loved one, this program allows you to view all the chat conversation without knowing the password. You can also turn on someone's archiving option and secretly log his or her conversation. * View Conversations : View Yahoo/MSN chat conversation without password. * Spy Tool : Spy on your kids or spouse. Copy, save or print the chat logs. * Secret Spying : You can also turn on someone’s archiving option and secretly log his or her conversations. * Network Viewer : View Yahoo/MSN chat from other computers.